I believe it is a horror or a thriller perhaps. The movie is a bunch of entries from the crew. The story is that a ship with a crew on board flies into a black hole, something like point of no return or that. They go crazy and eat each other. 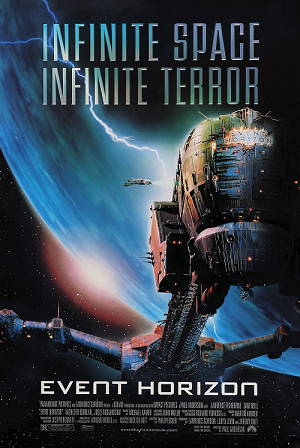 The movie Event Horizon (1997) features a crew investigating the return of an experimental FTL ship. The original crew used an artificial black hole as part of their drive tech, and went crazy when they crossed the event horizon, cueing much clawing of eyes from sockets and eating of flesh. The crew investigating the ship experience similar madness/evil as the drive mysteriously switches itself on. This description puts me in mind of the indi-movie The Drift which is available, from the production company, in full on YouTube here. The crew of a salvage ship goes into a dark nebula to scavenge a group of ships stranded by the "Darkwave" and finds them distressingly occupied. The occupants are warring cannibal clans who have managed to interconnect several large vessels into a rambling and horrific maze. From memory the story is told as a series of POV experiences of different crew members as they move through the ship-maze trying to complete their mission and not get eaten in the process. Identify a book set on a spaceship orbiting a black hole? Looking for name of an 80's movie or series about young people on a spaceship getting sucked into a black hole?